The first thing one would notice in Tiktik: The Aswang Chronicles is how incredibly gorgeous the computer-generated visuals are, at least compared to other Filipino productions. Opening with a shot of apologetic soon-to-be-father Makoy (Dingdong Dantes) cramped inside a tricycle with an old woman and her haul of various innards, the film immediately showcases how perfectly rendered the digitally-rendered background is, with the overloaded vehicle breezing through vast landscapes that seem to be exaggerated depictions of what is really out there. Matti dutifully maintains the spectacle throughout, struggling only when he decides to replace his actors with computer-generated monsters that are quite unimpressive. [Ed. note: We have been told by the production company that some CGI elements were rushed for the Filipino release of the film and are still being improved for future, international releases.] Nevertheless, Matti's efforts to overly stylize what essentially is a redo of the classic aswang tale bring the genre closer to its comic book roots. Filipino folklore crossed over to pop consciousness through the cheap comic books that mixed humorous sketches with more morbid and horrific tales involving ghosts, aswang, and other monsters. The aswang, which seems to be closest thing the Filipinos have to vampires considering that they both share the ability to morph to creatures and are deathly allergic to garlic and salt, is particularly notable because of its hunger for the young and the unborn. The typical aswang story, at least the one that has been repeated in popular cinema like Peque Gallaga and Lore Reyes' Aswang and Richard Somes' Ang Lihim ng San Joaquin (The Secret of San Joaquin) in Shake, Rattle and Roll 2 (1990) and Shake Rattle and Roll 2k5 (2005) respectively, involves a soon-to-be-father suddenly forced to protect his pregnant wife from an onslaught of hungry monsters. The situation the characters fall into emphasizes on the Filipino male's ability to be more than a provider but a protector. Even the more modern takes like Topel Lee's Yaya (Nanny) in Shake Rattle and Roll 8 (2006) and Richard Somes' Yanggaw (Affliction, 2008) on the tale has their heroes (a young boy tasked to protect his baby brother from a nanny who turns out to be an aswang and a father who has to decide what to do with his daughter who develops into an aswang, respectively) forced to abandon traditional roles and muster up courage and conviction to protect their families. Tiktik repeats the trope. Matti however emphasizes how domesticated and unprepared for battle the Filipino male has become, introducing, aside from Dantes' irresponsible pretty-boy, a cowardly husband (Joey Marquez) and red-lipped manservant (Ramon Bautista), among pregnant Sonia (Lovi Poe) and her mother Fely (Janice de Belen), all dominant and controlling females. The sudden onslaught of aswang, caused predictably by the brashness and stupidity of the impertinent newcomer, is made all the more thrilling, especially since there seem to be more mishaps in their intended defense of their respective loved ones than successes. Their rapid transformations from brazen or docile men to rightful heroes seem to be the heart of Matti's well-orchestrated madness. In the end, Matti has made a well-crafted tale wherein men do what men are supposed to do. 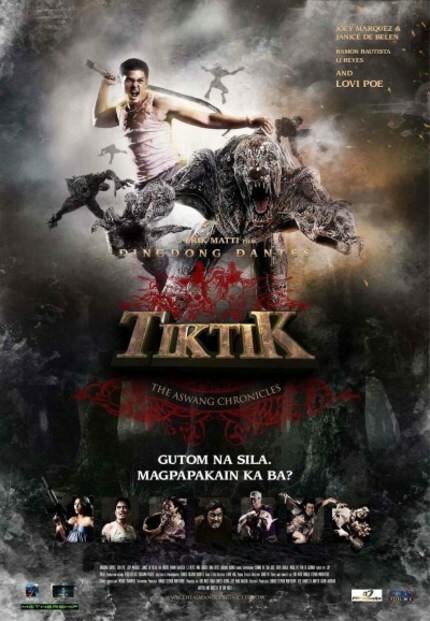 Like the comics that sustained the aswang from being obscure participants in regional folklore to something more mainstream, Tiktik indulges in comedy, infusing the tense and suspenseful setups with pockets of levity, whether it is a witty piece of dialogue or a visual joke that pokes fun at the macabre. There is some sort of humanity, a certain sense of cultural identity, and refreshing irreverence amidst Matti's meticulous craftsmanship. Matti just refuses to be drab and serious, opting to charm and captivite with his impressive grasp of hilarity, horror, and visual spectacle. Tiktik comes with all the right ingredients of an unabashedly entertaining film.